Union Navy Civil War North Carolina Naval United States U.S.
Battle of Sassacus and Albemarle, May 1864. (Left) Drawing entitled "Wood Versus Iron", a naval encounter during the American Civil War on 5 May, 1864 in Albemarle sound. 19th Century photograph of an artwork by Acting Second Engineer Alexander C. Stuart, USN, 1864. 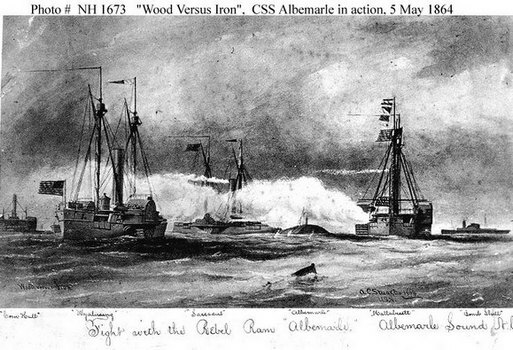 It shows CSS Albemarle engaging several Federal gunboats on Albemarle Sound, North Carolina, on 5 May 1864. From left to right are USS Commodore Hull, USS Wyalusing, USS Sassacus, CSS Albemarle, USS Mattabesett and the CSS Bombshell, which was captured during the action. Albemarle was not significantly damaged during this action, which left Sassacus disabled by a hit in one of her boilers. From Photo # NH 1673 Department of the Navy Historical Center. (Right) Battle between the Sassacus and the Albemarle, May 1864. In the war’s last few months Cushing played a major role in the Union Navy’s efforts to control the Cape Fear River. He sounded the channel of New Inlet during the Battle of Fort Fisher and conducted reconnaissance operations prior to the Battle of Fort Anderson. Having worked for over three years to blockade the Cape Fear coast, the navy finally got its opportunity to capture Fort Fisher and take control of the region in late 1864 and early 1865. 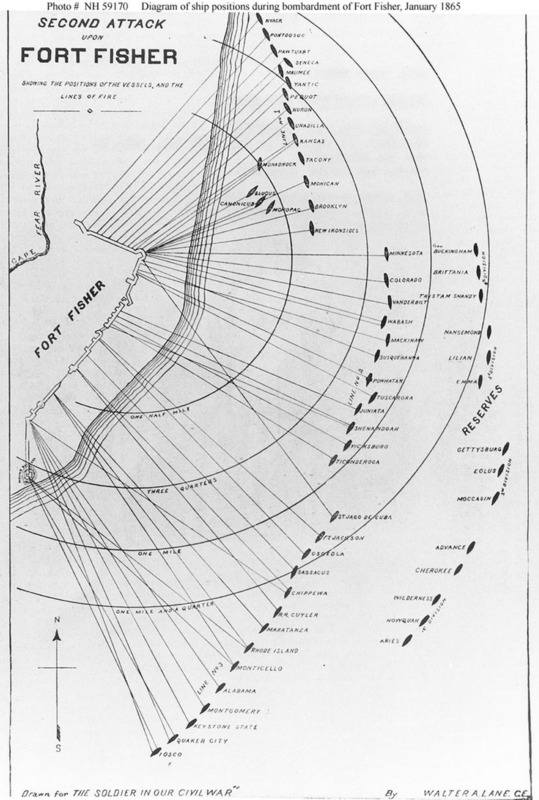 The bombardments of Fort Fisher on December 24-25, 1864, and January 13-15, 1865, were the largest in history at the time. Over the course of the two battles, the fleet fired over 40,000 shots. The navy later bombarded Fort Anderson, on the opposite bank of the Cape Fear, but not as heavily as it had shelled Fort Fisher. (About) Fort Macon, a masonry fortification, represented the typical fortress during the Civil War. Fort Macon was one of thirty new Third System coastal forts that were constructed along the coastline of the United States following the War of 1812. It was built on the eastern end of Bogue Banks, in the Outer Banks of North Carolina, and was intended to defend the entrance to the ports of Beaufort and Morehead City. It was designed for defense against attacking enemy naval forces and therefore constructed of masonry. When the Civil War began, rifled-artillery had been invented and added to U.S. warships, thus rendering all masonry forts obsolete. The rifled-barrel could deliver a projectile with pinpoint accuracy and devastating effect against masonry, stone and rock, and other fixed fortifications. Macon sustained 560 hits from Union guns during the Siege of Fort Macon from March 23 to April 26, 1862, on the Outer Banks of Carteret County, North Carolina, when Union forces, under the command of General Ambrose E. Burnside, pressed the fight during the North Carolina Expedition. The battle results in one Federal killed and eight Confederates killed and mortally wounded. In addition to larger smoothbores, navy vessels during the Civil War were armed with new rifled cannons that could accurately deliver heavier projectiles from much greater distances, therefore in 1867 Congress halted additional appropriations for Third System fortifications and in 1870 the construction of well-dispersed masonry-revetted earthen fortifications began. Sources: Daniel Ammen, The Atlantic Coast (Wilmington, 1989); John G. Barrett, The Civil War in North Carolina (Chapel Hill, 1963); Robert M. Browning, From Cape Charles to Cape Fear: The North Atlantic Blockading Squadron during the Civil War (Tuscaloosa, 1993); Chris E. Fonvielle, Jr., The Last Rays of Departing Hope: The Wilmington Campaign (Campbell, CA, 1996); Rod Gragg, Confederate Goliath: The Battle of Fort Fisher (New York, 1991); John W. Hinds, Invasion and Conquest of North Carolina: The Anatomy of a Gunboat War (Shippensburg, 1998); L.J. Kimball, The Battle of New River, 23-25 November 1862 (Jacksonville, NC, 1997); Rowena Reed, Combined Operations in the Civil War (Lincoln, 1993); Charles M. Robinson, III, Hurricane of Fire: The Union Assault on Fort Fisher (Annapolis, 1998); Richard A. Sauers, The Burnside Expedition in North Carolina: A Succession of Honorable Victories (Dayton, 1996).